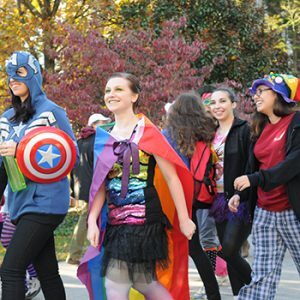 Traditions link the present to the past, and they provide a dash of fun and spirit to the Hollins experience. 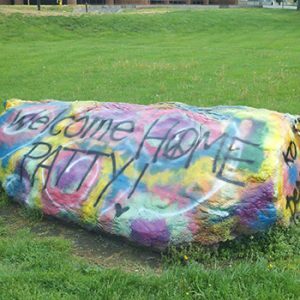 By tradition, only seniors can paint colorful messages on this large chunk of shale located near the science building. Faculty and administrators surprise students by singing favorite holiday songs outside the residence halls. Following Opening Convocation at the beginning of each academic year, seniors take their first official steps onto Front Quad. The money saved by serving a simple dinner goes toward service organizations. A festive gathering full of good cheer and delicious treats. Hollins Day pays tribute to all who played a crucial role in Hollins’ institutional history. 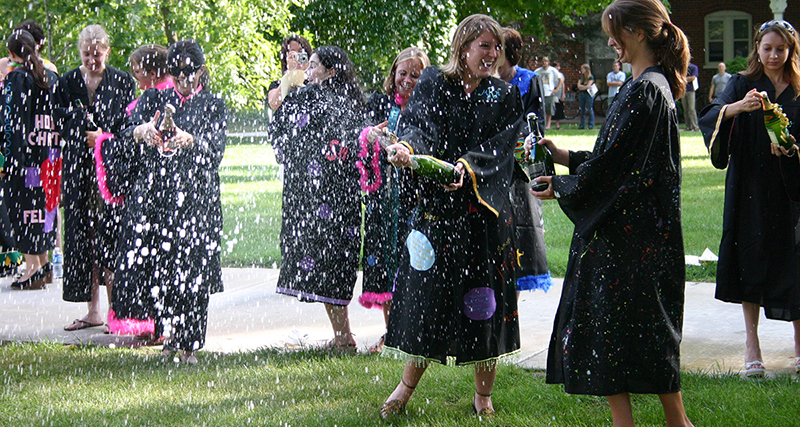 100 days before graduation, seniors have a party and reflect on their Hollins years. Matty Cocke, daughter of Hollins’ founder, was the first woman to head a college in Virginia. She served as Hollins’ president from 1901 to 1933. Role reversal: faculty and staff make pancakes for students during late-night study breaks before fall and spring finals. Seniors bequeath their decorated robes to juniors. Juniors take part in skits and other silly antics to earn their class rings and discover the identity of their senior sisters. Sophomores host a banquet honoring the senior class. Expanding on the longstanding tradition of the Hollins White Gift Service, this candlelight event of music, readings, and dance celebrates the spirit of the holiday season, and welcomes the diverse traditions of our community. On a surprise day in October, students, faculty, and staff don crazy costumes and hike Tinker Mountain. The reward: a picnic of fried chicken and Tinker Cake.